My daughters have been arguing lately. I could analyze the contributing variables: the cold weather that's kept us inside, a series of sicknesses, or the underlying crankiness from not sleeping as well as they normally do. But sometimes you're too tired for analysis. I asked the girls to sit across the kitchen table from one another and explain one thing they enjoy about each other. A little exercise in appreciation, I thought. Let's stir up some good feelings. "I like when you play in the other room away from me." "Well, I like it when you don't hit." The bar was low, indeed. I was tempted to lower my head to the table and admit, "Right now, what I like is when you're all asleep. Because it's quiet then." I don't particularly enjoy the hard moments of motherhood when I'm in the trenches, but I'm no longer surprised by them like I was when I was a new mom. I've lived through enough to recognize that rough patches smooth over. Challenges lead to insight and perseverance. Deep in my heart, I know that my kids are maturing, even if current behaviors or circumstances might point to the contrary. One day, many years from now, one of my grown-up daughters might call and say, "Mom, I tell you, the kids were terrible today. I think they're rabid; it's like we're raising feral squirrels. I sat them down at the table and made them compliment each other. You'll never believe what they came up with." But I'll believe. Oh, I'll believe, and I'll know just how to listen. I'll be able to tell her that she's going to make it through. 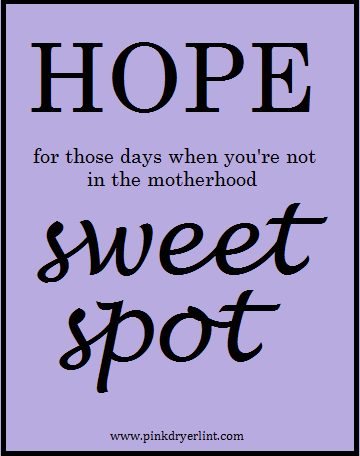 That's because it's the hard days that teach us that there's always hope in motherhood. If you're not in the sweet spot of motherhood today, know that this day won't last forever. You're going to make it, and so will your children. 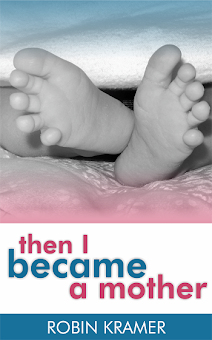 Read more motherhood musings from Robin Kramer: Then I Became a Mother. The rabidness is here too! I sent mine all outside despite the mud pit that once was grass. Oh Robin!! I so entirely feel your pain. I am in the sweet spot today as my girls are actually getting along and we are having a very relaxed family day. However, I have had many of those days. In fact, my two oldest fight more than they get along and I've done a similar activity to yours, making them write down nice things about the other. There are definitely ups and downs. You have such a wonderful, positive outlook and I know this, too, shall pass for you. Sending virtual hugs! It seems we are living parallel lives. The other day I made them go outside in freezing temperatures, just so I wouldn't be able to hear them. Spring cannot come soon enough. I needed this today. Terrible two's are in full force at my house. Hang in there, Gin! Solidarity -- and prayers -- being sent your way! Freezing temperatures makes them hearty, right? Do you find that spending time outdoors significantly improves your kids' outlooks when they come back inside? It's remarkable how much this can help! How was the laundry after all that mud? Hearty or frozen. Or maybe, heartily frozen....frozenly hearty?